Miller making his Carnegie Hall debut at Weill Hall on March 6, 2011. Barely out of his graduation robes, Jared Miller, BMus’10, has found a second home at Carnegie Hall. This spring Miller completes his Master of Music degree at Juilliard. His composition Souvenirs d’Europe was premiered by Canadian pianist Ang Li a few months ago at Carnegie Hall, and his piece for solo piano, Instincts, won him a 2011 SOCAN Young Composers Award. His new orchestral work, Cartoon Music: Three Movements for Orchestra, was premiered by the Juilliard Orchestra at their concert home in Lincoln Centre this February. “Conductor Jeffrey Milarsky was really enthusiastic, and the orchestra sounded wonderful,” says Miller. Miller hails from Burnaby. Trained as a pianist, he began at UBC as a composition major studying with Dorothy Chang and Stephen Chatman. 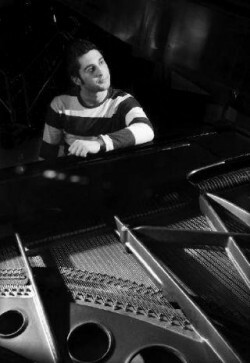 He also studied piano with Sarah Davis Buchner and Corey Hamm. By the time he graduated, Miller was on the radar of a number of important Vancouver music organizations. In 2008 he had a piece aired at the Vancouver Symphony’s Coulthard Readings, an important program named for long-time UBC luminary Jean Coulthard that provides a first chance for selected young composers to hear their orchestral thoughts performed live at the Orpheum. Miller’s piece led to a small VSO commission, 2010 Traffic Jam, which managed the neat trick of being a fine orchestral scherzo and becoming a popular favourite. A resident of Manhattan since the summer of 2010, Miller has sampled a goodly number of compositional milieus while chipping away at his degree requirements. Two of his works involved students from Juilliard’s cohort of dancers. Aftermath was a collaboration with senior dance student Natham Makolandra featuring music for string quartet, and Roi is a collaboration with choreographer Ingrid Kapteyn written for woodwind quartet. Last June Miller offered a new take on the piano recital with a program he called “A New York Tasting Menu,” complete with a New York-inspired buffet. But Miller has also kept up with the Vancouver scene and his piano playing. Last June he offered a new take on the piano recital with a program he called “A New York Tasting Menu,” complete with a New York-inspired buffet. It was the perfect showcase for Miller’s new skills and influences and a reunion of sorts with friends and colleagues – part of a career-building strategy that has now gone national and international. He’ll be back in Vancouver this summer for another program on June 2. You can sample Miller’s music on his website. Enjoyed the article and look forward to getting the newsletter.